Today I had a raft of emails from which I wanted to unsubscribe. It happens. But the experience was so variable between the different service providers that it’s worthy of a blog post. Box came up first – I don’t use the service and so why are they writing to me. 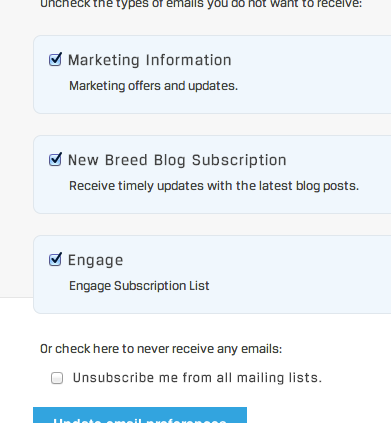 They use Eloqua for email distribution and I have to type in my address in order to unsubscribe. Not good. You know my address, therefore you should have it pre-populated. live – I won’t go and I don’t want more invites to events that I can’t attend. 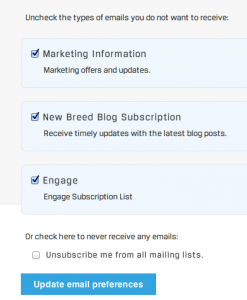 They use Hubspot for email distribution and I find that I can update my email ‘preferences’ and select to only get their blog posts by email. Perfect! Check your own set-up by subscribing to your mail list (I always do this for our clients) and see what your unsubscribe experience is like. Don’t want to annoy customers.